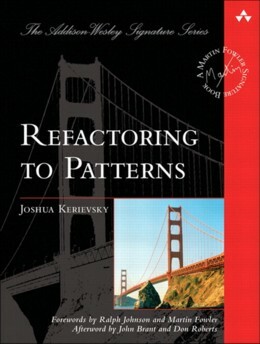 Refactoring to Patterns is a book by Joshua Kerievsky published by Addison Wesley in August 2004. You can purchase a copy through us at a 30% discount. On March 17th, 2005, Refactoring to Patterns won the prestigous Jolt Productivity Award. What Is Refactoring To Patterns? Refactoring to Patterns is the marriage of refactoring -- the process of improving the design of existing code -- with patterns, the classic solutions to recurring design problems. Refactoring to Patterns suggests that using patterns to improve an existing design is better than using patterns early in a new design. This is true whether code is years old or minutes old. We improve designs with patterns by applying sequences of low-level design transformations, known as refactorings. What Are The Goals Of This Book? Legacy development, in which you are mostly maintaining a legacy system. Whether you are doing greenfield or legacy development, the refactorings and design ideas in this book will help you with your work. What Background Do You Need? This book assumes you are familiar with design concepts like tight- or loose-coupling and object-oriented concepts like inheritance, polymorphism, encapsulation, composition, interfaces, abstract and concrete classes, abstract and static methods and so forth. I use Java examples in this book. I find that Java tends to be easy for most object-oriented programmers to read. I've gone out of my way to not use fancy Java features, so whether you code in C++, C#, VB.NET, Python, Ruby, Smalltalk or some other object-oriented language, you ought be able to understand the Java code in this book. To understand the pattern-directed refactorings in this book, you don't need to know every refactoring listed above. Instead, you can follow the example code that illustrates how the above refactorings are implemented. However, if you want to get the most out of this book, I do recommend that you have Refactoring [F] close by your side. It's an invaluable refactoring resource, as well as a useful aid for understanding this book. The patterns I write about come from the classic book, Design Patterns [DP], as well as from authors such as Kent Beck, Bobby Woolf and myself. These are patterns that my colleagues and I have refactored to, towards or away from on real-world projects. By learning the art of pattern-directed refactorings, you'll understand how to refactor or towards patterns not mentioned in this book. You don't need expert knowledge of these patterns to read this book, though some knowledge of patterns is useful. To help you understand the patterns I've written about, this book includes brief pattern summaries, UML sketches of patterns and many example implementations of patterns. To get a more detailed understanding of the patterns, I'd recommend that you study this book in conjunction with the patterns literature I reference. This book uses UML 2.0 diagrams. If you don't know UML very well, you're in good company. I know the basics. Whie writing this book, I kept the third edition of Fowler's UML Distilled close by my side and referred to it often. “Refactoring to patterns is a revolutionary approach to applying patterns that combines the top-down utility of design patterns with the bottom-up discovery of iterative development and continuous refactoring. Any serious software developer should be using this approach to discover new opportunities to use patterns to improve their code.” —Bobby Woolf, Consulting I/T Specialist, IBM Software Services for Web- Sphere, and coauthor of Enterprise Integration Patterns (Addison-Wesley) and The Design Patterns Smalltalk Companion (Addison-Wesley). © 1996-2011, Industrial Logic, Inc. All Rights Reserved.